We are named among the leading importers and suppliers of a broad gamut of Airway Management Trainer. Valued clients receive this range from us at the competitive prices as we are committed to support them in every possible manner. Besides, our range also includes, Airway Management Trainer, Adult Airway Management Trainer With Board and Advanced Airway Larry Airway Management Trainer Torso many more. 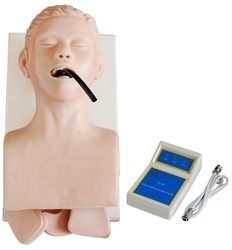 This model is designed as a teaching model for training the medical students, basic clinic nurses and first aid people to demonstrate and practice trachea intubation through mouth. 1. Trachea intubation through mouth. 2. Compare pupils: one is normal, another is large. 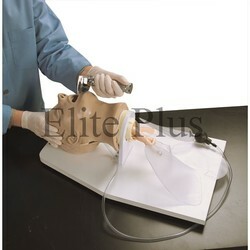 Adult Airway Management Trainer with Board offered by our organization is of excellent quality. Range that we offer is featured by its long time service, smooth performance and large areas of applications. Addition to this, doctors and many other practitioners use our range for their convenience. 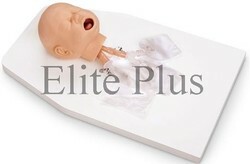 Backed by a rich industry experience, we are offering patrons a premium quality range of Infant Airway Management Trainer with Stand that is widely used around the globe for teaching, training and educating purposes. We source these infant airway management trainers from certified vendors available in international market. These infant airway management trainers are highly appreciated for its real-like appearances. These trainers are manufactured in adherence with international norms and standards. Customers can avail these trainers from us. We also delivery these products at customer's premises within stipulated time. The Airway Larry Adult Airway Management Trainer with Stand non-anesthetized patients for practicing intubation, ventilation, and suction techniques. Realistic anatomy and landmarks including teeth, tongue, oral and nasal pharynx, larynx, epiglottis, asteroids, false cords, true vocal cords, trachea, lungs, esophagus, and stomach. The trainer allows you to practice oral, digital, and nasal intubation, as well as E.T., E.O.A., P.T.L., L.M.A., E.G.T.A., and combitube ® insertion. Suction techniques and proper cuff inflation may also be practiced and evaluated. Features durable, rugged, one-piece construction and bifurcated lungs. 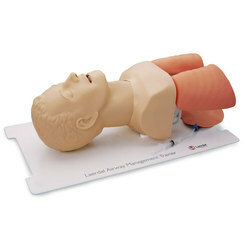 “Airway Larry” represents an adult with more room to maneuver than the adult trainer (LF03603U). With its slightly anterior position, “Airway Larry” is a great trainer for introductory as well as advanced students. It is ideal for testing purposes and combitube ® practice. Applying pressure to the cricoid cartilage changes the position of the trachea and closes the esophagus, allowing realistic practice of the sellick maneuver. The jaw thrust technique can also be practiced. The trainer can also be attached to either nasco’s cparlene ®, crisis ™ manikin, or any non-modular resusci ® anne™ brand CPR manikin. Comes with training stand to mount head, pump spray lubricant, and hand carrying hard case. Three-year warranty. Realistic practice is the key to developing proficiency in airway management skills. The Laerdal Airway Management Trainer's lifelike upper torso and head simulates real-world complications when practicing a variety of intubation, ventilation, and suction techniques. 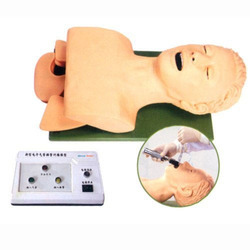 This model is used to demonstrate the newborn baby intubation and train the students to learn intubation skills. Served as an ideal model for medical colleges, nursing schools and hospitals etc. Made of elastic PVC plastic.